I remember the day when they removed the roof. 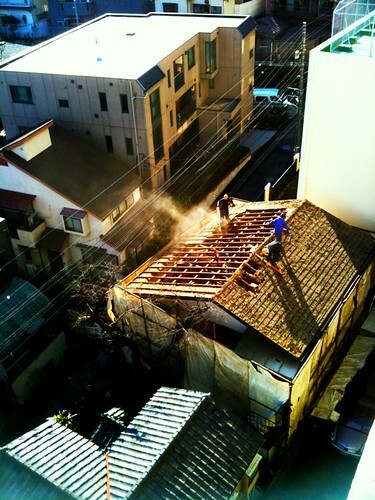 There were great plumes of dust and debris from the crumbling shingles. I felt sorry for the people who lived downwind. Hopefully they didn’t hang any laundry that day. They took the whole house down in a couple days, but took forever putting in the foundation. When I saw the depth of the foundation they had dug, I knew that it wouldn’t be just a couple of the prefab ‘rabbit houses’ that are often erected on subdivided land. Once they built it up to a fourth floor (including basement), I realized it would be an apartment building. Three above ground floors is the maximum without having to install an elevator. It appeared to be a reinforced concrete structure. Notice how the entire construction site is enclosed. 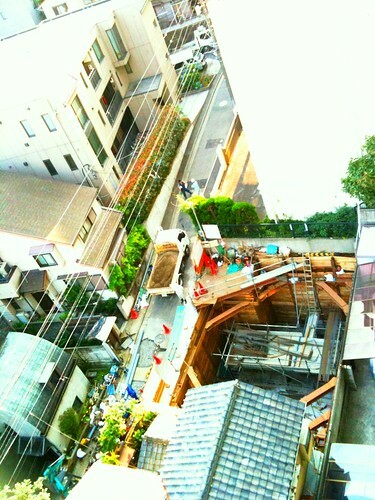 I like how tidy and contained construction sites are in Japan, necessary for such a dense built environment. Some even have decibel meters to monitor the sound level. Although, this site was very very noisy and I’m sure exceeded legal limits on noise. 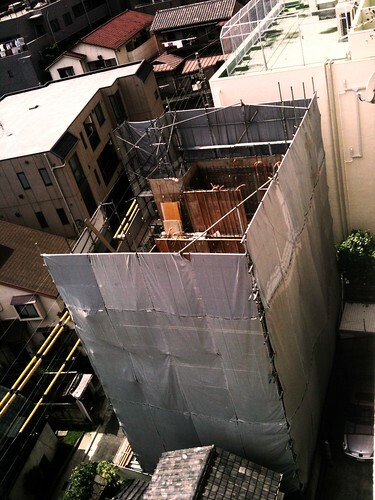 Even after the building was up and the scaffolding came down, there were a couple months of extremely loud noise. I suspect the builder had made a mistake and was correcting it. 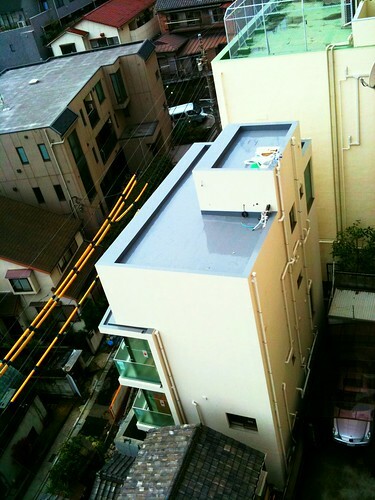 When the construction stopped I of course checked out the finished product and was surprised to find that it wasn’t an apartment building, but a single-family home, very large by Tokyo standards. It has all the elements of current trends in Tokyo. Lots of glass, bare concrete, a basement room with sunken lighting. And I was surprised to find an Italian surname on the mailbox. I still haven’t taken a picture of the facade but I’ll append it here eventually. For all the pictures you can see it as a slide show. Sorry for the inconvenience it might cause you. I noticed that every building only with a few windows, and residents probably need to have their lights on constantly. I like houses with enough space to allow sunlight to reflect itself, but I’m aware that how hard it is to live in a big city like Tokyo. It seems to make everything impossible. 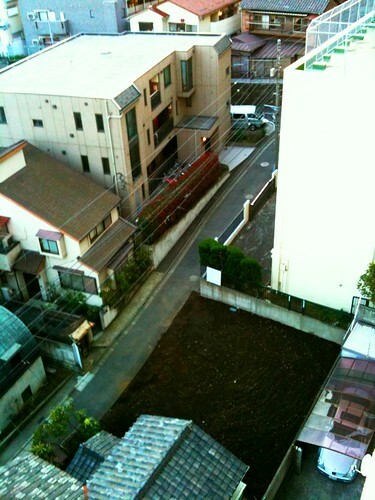 it’s true, there are a lot of north-facing apartments in tokyo, and many south-facing ones are obscured by other buildings. fortunately, mine is sunny all day, and the building in this post has a lot of windows on the south of the building, which i’ll take a picture of soon.